In a new video series launched by The Wire, in collaboration with Indo-Pak Conflict Monitor, Dr Happymon Jacob unpacks key themes relating to India's national security with senior well-known experts from India and around the world. National Security Conversations with Happymon Jacob emphasises on accurate information, in-depth analysis and informed opinion. National Security Conversations - Ep 24 What’s wrong with Modi government’s defence policy? Happymon Jacob talks to Pravin Sawhney (Founding editor FORCE magazine) about Prime Minister Narendra Modi’s defence policy, need for understanding the real threat from China, future of warfare and India’s unpreparedness for the same. National Security Conversations - Ep 23 -Why Have India-Pakistan Bilateral Relations Taken a Negative Turn? Happymon Jacob talks to Amb. Aziz Ahmed Khan (Pakistan's High Commissioner to India from June 2003 to September 2006) and seasoned Indian diplomat Amb. K. C. Singh, to understand why India-Pakistan bilateral relations have taken a negative turn. The conversation veers into possibilities of redirecting the bilateral relationship towards peaceful coexistence and what each country will have to do to achieve this end. National Security Conversations - Ep 22 - Should There Be Trade Between India and Pakistan? Happymon Jacob speaks to Prof. Nisha Taneja (Professor, Indian Council for Research on International Economic Relations) about the issues of formal and informal trade between India and Pakistan. The conversation further examines the impact of joint business forums and lobbies on trade; the potential of e-commerce and connectivity projects and major policy changes that need to be implemented by both countries to improve trade. India's decision to cancel the Foreign Minister level talks on the sidelines of UNGA in New York has raised a number of questions. Happymon Jacob tries to understand the reasons behind this decision and its impact on India-Pak ties. Dr. Happymon Jacob talks to Amb. Shiv Shankar Menon about the state of India’s national security. The conversations delves into contemporary challenges that India faces, the meaning of security and the goals of the national security apparatus. Dr. Jacob and Amb. Menon also discuss India’s relations with its neighbours and what India must do to continue its rise along with China. Happymon Jacob talks to Dr Arvind Gupta about India’s national security institutions, overlap in their mandates, issues in the coordination of their activities, importance of the National Security Council and its role in formulating India’s grand strategy. Happymon Jacob discusses the performance and implications of Washington's South Asia Policy 2017 with Bharath Gopalaswamy, director, South Asia Center at the Atlantic Council. Happymon Jacob discusses the controversy surrounding the BJP-led government’s decision to buy 36 Rafale fighter jets from France with senior journalists Ajai Shukla and M.K. Venu. Dr Happymon Jacob speaks with Col (Retd) Ali Ahmed about doctrinal thinking in the Indian armed forces and the need to devise a comprehensive national security strategy. National Security Conversations Ep 16- Does the Indian Military Have Adequate Level of Jointmanship? Happymon Jacob talks to Air Vice Marshal (retd.) Arjun Subramaniam about the problems of jointness in the Indian military. Happymon Jacob talks to former ambassador Rakesh Sood about the state of play on the global nuclear non-proliferation regime, the nuclear nonproliferation treaty and India’s place in the global nuclear order. Rakesh Sood was India's first permanent representative to the conference on disarmament at the United Nations in Geneva and special envoy of the Prime Minister for disarmament and non-proliferation Issues (2013 to 2014). National Security Conversations Ep. 14- 'Prime Minister Imran Khan': Implications for India. Happymon Jacob discusses the result of general elections in Pakistan with Dr. Ashok K.Behuria. He is a close observer of developments in South Asia and has been awarded the prestigious K Subrahmanyam Award for excellence in strategic studies for his work on Pakistan in 2009. The conversation revolves around the impact of a new govt. in Pakistan on its domestic and foreign policy. Dr Happymon Jacob in conversation with Amb Meera Shankar, former Indian ambassador to the US, about the challenges and opportunities facing the India-US strategic partnership, the upcoming 2+2 dialogue and managing strategic relationships with other major players, particularly in Asia. Happymon Jacob talks to K. C. Singh, former Indian Ambassador to Iran, about India’s decision to reduce oil imports from Iran under US pressure, Trump’s impact on the global political order and how PM Modi’s foreign policy of ‘running with the hares and hunting with the hounds’ is misdirected. National Security Conversations Ep. 11 - Surgical Strikes: Tactical Success, Strategic Failure. Dr. Happymon Jacob talks to Lt. Gen. H. S. Panag (retd.) on the ongoing counter-insurgency operations in J&K, politicisation of the armed forces, and the surgical strike of September 2016. National Security Conversations Ep 10 Has PM Modi’s foreign policy been an unmitigated disaster? In the tenth episode of National Security Conversations, Dr. Happymon Jacob discusses with Mr. Manish Tewari the successes and failures of PM Modi’s foreign policy, deteriorating neighbourhood relations and future steps that India must take to regain trust in the region and balance China. National Security Conversations Ep. 9 - Has India’s Afghanistan Policy Served Us Well? Happymon Jacob speaks to Vivek Katju, former Indian ambassador to Afghanistan, on India’s Afghanistan policy, Taliban’s increasing influence, Pakistan’s efforts to influence Afghan policy towards India and joint efforts by India and China to stabilise the region. National Security Conversations Ep. 8 - Have nuclear weapons made India more secure? Happymon Jacob interviews Dr Manpreet Sethi, one of India's leading expert on Nuclear strategy and discusses India's Nuclear Policy. National Security Conversations, Ep 7: Is India Losing Kashmir? Happymon Jacob interviews former J&K CM Farooq Abdullah about the unrest in Kashmir and what needs to be done in order to bring normalcy and peace to the valley. Does the Absence of Defense Reforms Endanger India’s National Security? What Was the Purpose of Modi's Informal Summit With Putin? In the latest episode of 'National Security Conversations', Happymon Jacob speaks to Anuradha M Chenoy, former Professor at the Centre for Russian & Central Asian Studies, Jawaharlal Nehru University, about the informal summit between Indian PM Modi and Russian President Putin in Sochi, Russia. Amarjit Singh Dulat, former chief of the Research and Analysis Wing (RAW), talks about the political and security situation in Kashmir in the third episode of 'National Security Conversations with Happymon Jacob'. National Security Conversations Episode 2: Ceasefire Violations Along the LoC - with Syed Ata Hasnain, Retd. Lieutenant General in the Indian army. Happymon Jacob, associate professor at JNU, discusses ceasefire violations along the Line of Control (LoC) with Syed Ata Hasnain, Retd. Lieutenant General in the Indian army. Happymon Jacob, associate professor at JNU, discusses the recently concluded 'informal' summit meeting between PM Modi and Chinese president Xi Jinping with Alka Acharya, professor of Chinese Studies at the Jawaharlal Nehru University. 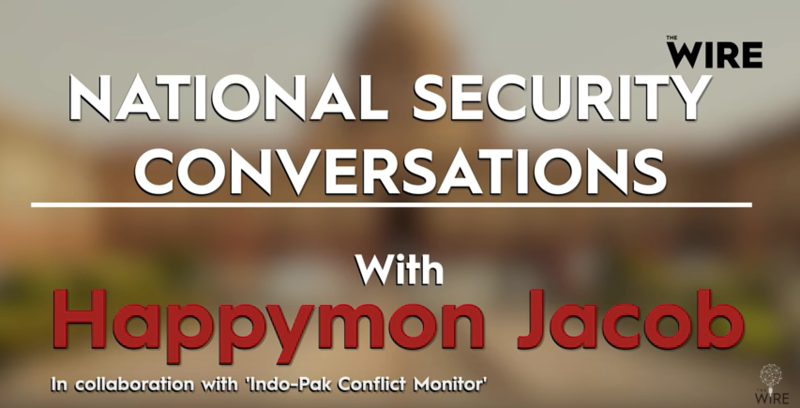 National Security Conversations with Happymon Jacob' is an upcoming fortnightly series on The Wire that will discuss critical issues relating to India's national security.